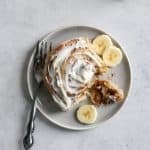 These fluffy banana cinnamon rolls are definitely the perfect brunch item for any occasion. A lightened up filling but full of flavor, egg-free, and options to make vegan friendly. In a microwave safe bowl or glass measuring cup, heat milk for about 20-30 seconds. Allow temperature of mixture to reach 110F (or lukewarm). If it’s too hot it will kill the yeast. Add yeast and sugar into large mixing bowl of stand mixer and gently add milk. Stir until combined and allow to sit for 10 minutes, until top is foamy. If your mixture doesn’t get foamy, the yeast did not activate. Once the milk and yeast mixture is foamy, add melted butter and mashed banana mixing low speed until combined. Start to add flour, salt, and nutmeg if using – about ½ cup at a time. You will likely need about 3 1/2 cups. Dough should be elastic and start to pull away from edge of bowl when it is ready. At this time, change the attachment to the dough hook, and allow the hook to knead the dough on low speed for about 5 minutes. Dough should remain soft but not overly sticky – this is typically where I add another 1/4 cup of flour with the mixer running, then stop the mixer once the flour has mixed in slightly, reposition the dough and start the mixer again. Oil large bowl and shape dough into ball, place dough in bowl and cover with towel and let rise in warm environment until dough has doubled in size, about 45 minutes. TIP: set oven to warm or preheated to 200F then turn off. Place bowl in the warmed oven and allow to rise. Grease a 9×13″ baking dish with butter or coconut oil, set aside. Once the dough has about doubled in size, lightly cover rolling pin and flat surface with flour. Roll out dough into a 15×9 inch rectangle. Be patient, and roll gently. Don’t use too much flour or your dough will be stiff. Spread on softened butter, sprinkle sugar and spices; gently pat to let sugar absorb into butter slightly. Place sliced bananas flat on dough in 3 long rows (see picture in post). Using the heels of your hands and thumbs, gently roll dough into a long roll, placing seam side down. Use floss method to slice rolls (this video helps for a visual) or a serrated knife to gently cut into about 1 1/2″ width. You should get about 12 rolls for a 9×13 pan. Place rolls in greased pan, leaving room to rise, and put pan in draft-free environment. You can use the warm oven tip above. See notes below for overnight adaptation. Once the rolls have risen again slightly (about 15 minutes), preheat oven to 350F (take rolls out and wait for oven to get up to 350F). Bake cinnamon rolls for 20 minutes, until lightly browned. Then, if necessary, cover top of rolls with foil and bake for an additional 5 minutes. Covering the rolls for the last 5-10 minutes will prevent them from getting too brown on the top. Make the cream cheese frosting: In medium bowl using electric hand mixer (or stand mixer with paddle attachment) beat softened cream cheese and yogurt until light and fluffy. Add in extract and powdered sugar; mix on low speed until combined. Spread on slightly cooled banana cinnamon rolls. Best served warm – enjoy! *If you don’t have bread flour, you can sub unbleached all-purpose flour, or whole wheat pastry flour, but bread flour will produce the lightest and fluffiest rolls. TO MAKE DAIRY-FREE: sub vegan butter or butter flavored coconut oil in cinnamon roll recipe and sub dairy-free cream cheese and yogurt for frosting. *Nutrition info approximate, does not include cream cheese frosting. This recipe adapted from my gingerbread cinnamon rolls.